Bores Hole is designated as a RIGS because it contains a key interval of the Middle Chalk that cannot be easily studied elsewhere in the Medway Valley; and for its historical importance. Bores Hole chalk pit forms part of a network of Chalk RIGS within the Medway Valley. Sites here show significant differences in chalk thickness, facies and flint development when compared with the Kent coastal sections. 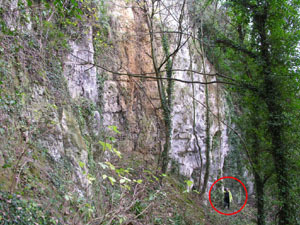 The red circle shows Professor Andy Gale to give scale to the photograph of the chalk pit. At Bores Hole the higher parts of the Middle Chalk and some of the Upper Chalk is exposed in the rather overgrown cliff faces. Although only the lower part of the section is accessible, thin marl bands (e.g. Southerham Marl) and certain flints have been identified that are used for correlation throughout the Anglo-Paris basin. 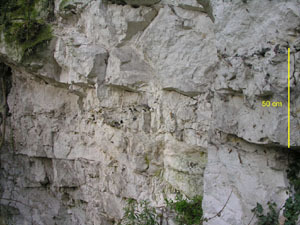 These precisely tie the site into the regional stratigraphy and make it a key locality for the inland examination of the middle and upper Turonian (Middle Chalk) in the Medway Valley. During the late 19th and early 20th centuries important fossil discoveries were made at the pit including a lizard jawbone unique in the English chalk. Bores Hole was surveyed for designation as a RIGS in December 2005. There is no easy parking area but a small number of cars can be parked along the adjacent lane. Access is relatively easy, there is no fencing. 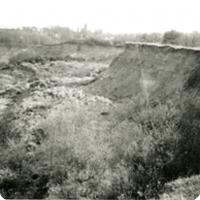 Care must be exercised when visiting the chalk pit as the faces are vertical and hence there is the risk of falling debris. The quarry floor is also uneven under foot.